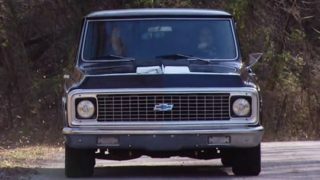 The '89 Blazer gets stripped to bare metal for repair, and our SuperMax Silverado is treated to front suspension & fuel delivery upgrades, plus performance brakes. 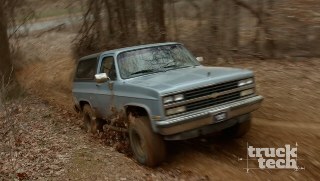 We introduce our '89 Blazer with a raucous trail ride to show capabilities of Chevy's full size 4x4 in stock form. 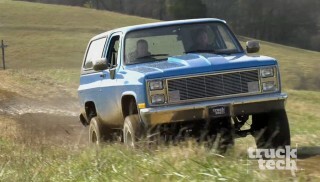 Then we bring it back, tear it down, and begin building the ultimate trail/show fun truck. 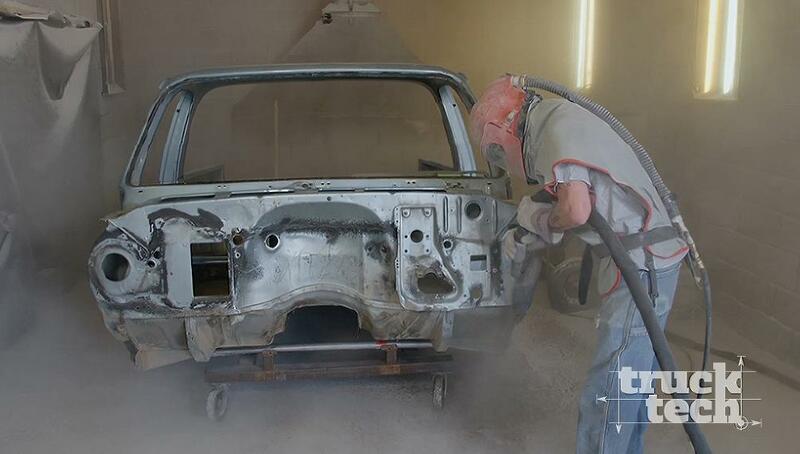 After months of prep, the '89 Blazer hits the paint booth for a custom mix of color. 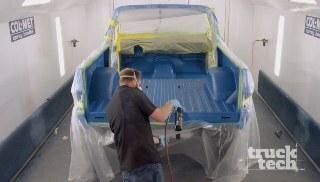 And to accompany the panels will be a color-matched bedliner. 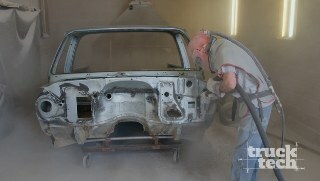 Restoration of our 89 Blazer continues by stripping the frame bare and repairing the damage. Plus junkyard how-to as the guys go searching for axles. Our '89 blazer frame is back from powdercoat where it can be turned into a rolling chassis with suspension, rebuilt junkyard axle, wheels and tires. Our Blazer chassis gets its big block and trans inside the frame rails, and the SuperMax Silverado LB7 is fully dressed with turbo, charge and intake pipes. Project “Klassy K5” gets one step closer to wearing its final coat of paint. The cab and firewall are jammed out in BMW Protronic Blue, then gets re-united with the chassis for good. 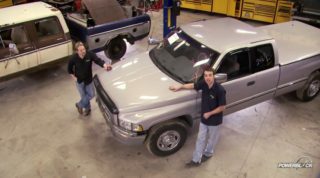 Plus, the guys show body some body work basics. 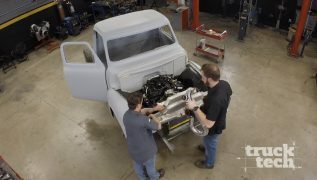 Truck Tech is advancing two projects at once, LT tackles a rear end upgrade on the F100 and Jeremy starts a supercharger install on Klassy K5. (NARRATOR)>> KLASSY KFIVE IS BACK AFTER GETTING TORN UP, TORN DOWN, AND STRIPPED BARE. ON TAP TODAY, METAL REPAIR. 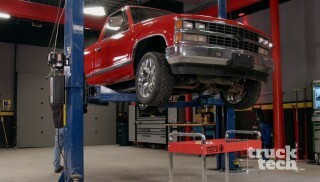 PLUS HOW TO REFRESH THE INDY FRONT SUSPENSION ON OUR SUPERMAX SILVERADO. TRUCK TECH STARTS NOW. (LT)>> HEY GUYS, WELCOME TO TRUCK TECH. TODAY WE HAVE OUR '89 CHEVY BLAZER BACK IN THE SHOP THAT WE'VE NICKNAMED "KLASSY KFIVE". THE SQUARE BODY CHEVY IS ONE OF AMERICA'S MOST POPULAR STYLES OF TRUCK TO BUILD RIGHT AT THE MOMENT, AND WE'RE GONNA PUT OUR CUSTOM TOUCH ON THIS ONE. WHEN IT'S DONE IT'S GONNA HAVE A KILLER STANCE, A POWERFUL ENGINE, AND BEST OF ALL, SHOW WINNING PAINT. (JEREMY)>> THAT'S RIGHT, WE WANT TO BUILD SOMETHING THAT STANDS OUT IN THE CROWD, AND IF YOU REMEMBER THE LAST TIME YOU SAW THIS THING WE TOOK IT OUT, DID A LITTLE WHEELING, AND WE HAD A BLAST, BUT THEN WE BROUGHT IT BACK TO THE SHOP AND TORE IT COMPLETELY DOWN. THAT GAVE US A REALLY GOOD IDEA FOR WHAT WE NEEDED TO RESTORE AND WHAT WE COULD REPLACE. (LT)>> BECAUSE OF THE HIGH LEVEL OF QUALITY THAT WE'RE AFTER ON THIS BLAZER, THERE WAS REALLY NO OTHER OPTION FOR US THAN STRIPPING DOWN TO BARE METAL AND STARTING FROM SQUARE ONE. (JEREMY)>> SO WE HEADED OVER TO SEE OUR FRIENDS AT BLAST FROM THE PAST IN LEBANON, TENNESSEE, BECAUSE WHEN WE NEED SOMETHING DONE YESTERDAY OWNER VANCE GREGORY ALWAYS COMES THROUGH FOR US. 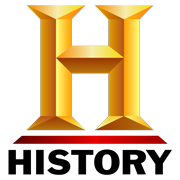 (VANCE)>> HERE AT BLAST FROM THE PAST WE'LL DO A LITTLE BIT OF EVERYTHING, CHASSIS, CAR BODIES, LAWN FURNITURE, ANYTHING WE CAN GET OUR HANDS ONE, SMOKERS. WE'RE USING A FINE CRUSHED GLASS. IT CLEANS VERY WELL. IT'LL PROBABLY TAKE, ON ALL OF IT, THE PARTS PLUS THE SHELL, YOU'RE PROBABLY LOOKING AT SIX TO EIGHT HOURS. MAYBE A LITTLE MORE DEPENDING ON HOW MUCH MATERIAL'S ON THE BODY PANELS. (JEREMY)>> ALL RIGHT, SOMETHING TO REMEMBER WITH FRESHLY BLASTED STEEL IS DON'T TOUCH IT WITH YOUR BARE HANDS. THROW ON A PAIR OF GLOVES BECAUSE IF YOU TOUCH IT WITH BARE SKIN IT'S PRETTY MUCH GONNA INSTANTLY RUST. NOW SINCE WE'VE GOTTEN THIS THING BACK AND HAD A CHANCE TO LOOK IT OVER IT'S ACTUALLY IN REALLY GOOD SHAPE. THERE'S NOTHING REALLY ANY WORSE THAN WHAT WE THOUGHT. WE'VE GOT A FEW STRESS CRACKS IN THE FLOOR THAT WE'LL HAVE TO TAKE CARE OF, AND OBVIOUSLY SOME RUST, AND THERE'S A LITTLE MORE IN THE BACK BUT IT'S NOT THAT BAD. NOW IF YOU'LL REMEMBER LAST SEASON WITH THE F-100 I SHOWED YOU HOW TO PROPERLY PREPARE STEEL FOR BODY WORK. SINCE WE'RE NOT GONNA HOP RIGHT IN ON THE FILLER WORK ON THIS ONE I'M GONNA DO SOMETHING A LITTLE DIFFERENT. I'M GONNA APPLY A COUPLE OF COATS OF EPOXY PRIMER. IT'S GONNA GIVE US SOME REALLY GOOD ADHESION CAPABILITIES AND IT'S GONNA KEEP ALL THIS PROTECTED. LET'S GET IT OVER IN THE BOOTH. ALL RIGHT, THIS SEALER WE'RE GOING TO BE LAYING DOWN ON OUR KFIVE IS DP 50. NOW THEY RECOMMEND THAT YOU SPRAY IT AT EIGHT TO 10 POUNDS OF PRESSURE AT THE AIR CAP, BUT HOW DO YOU KNOW HOW MUCH PRESSURE YOU HAVE RIGHT HERE? IT'S EASY TO READ AT THE INLET BECAUSE WE NORMALLY HAVE A GAUGE THERE, BUT HERE'S A PRETTY COOL WAY YOU CAN DO IT. THIS IS AN AIR CAP TEST KIT THAT I PICKED UP FROM SUMMIT RACING. BASICALLY IT'S HAS AN AIR CAP WITH A TUBE THAT MEASURES PRESSURE, RUNS IT OUT TO A GAUGE FOR US. SO AT EIGHT POUNDS THAT PUTS US AT ABOUT 18 PSI AT THE INLET. SO EVERY TIME I UNHOOK I'LL KNOW TO SET THIS BACK AT 18 POUNDS AND WE'LL BE AT EIGHT AT THE AIR CAP. EPOXY IS A VERY IMPORTANT STEP, ESPECIALLY ON A RESTORATION LIKE THIS WHERE YOU KNOW THERE IS POTENTIAL IT WILL SIT IN BARE METAL FOR A WHILE. I'M LAYING DOWN TWO COATS, AND WE'LL LET THAT CURE OVERNIGHT. 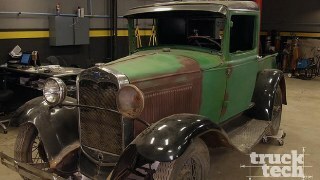 ALL RIGHT, WE SHOWED YOU THE CANCER INSIDE THE TRUCK, BUT AS FAR AS THE OUTSIDE GOES THERE'S NOT REALLY THAT MUCH RUST. WE JUST HAVE A LITTLE BIT RIGHT HERE IN THE BED SIDE. HOPEFULLY WHEN WE CUT THIS OUT THE INNER STRUCTURE WILL BE IN GOOD SHAPE, BUT YOU KNOW HOW THAT GOES. NOW WE COULD ORDER A BED SIDE AND CUT A SECTION OUT OF IT BUT SINCE THIS IS SO SMALL I'M JUST GONNA SHOW YOU HOW TO MAKE IT. THAT'S 13-16THS AND ABOUT THREE QUARTER, CUT IT A LITTLE LARGE. I'M STARTING BY PULLING A MEASUREMENT OF ONE AND THREE QUARTER INCHES BY SIX INCHES ON A NEW PIECE OF METAL. THEN CUTTING THE PIECE OUT WITH MY ELECTRIC METAL SHEARS. NEXT UP IS TO MAKE A MARK WHERE I NEED TO BEND THE METAL. OVER AT THE BREAK I'LL BEND IT TO THE SHAPE I NEED. (JEREMY)>> ALL RIGHT, IT'S LOOKING REALLY GOOD. GOT A LITTLE BIT OF METAL FINISHING LEFT TO DO, KIND OF SHAPE THIS BODY LINE A LITTLE BETTER, BUT ALL IN ALL IT'S LOOKING REALLY GOOD AND IT ONLY TOOK ABOUT 45 MINUTES TO DO. SO IT JUST GOES TO SHOW IF YOU'VE GOT THE RIGHT METAL TOOLS YOU CAN BUILD JUST ABOUT ANYTHING. (NARRATOR)>> AHEAD SUSPENSION, BRAKES, AND FUEL GOODIES FOR OUR SUPERMAX SILVERADO. (LT)>> TODAY WE HAVE PROJECT "SUPERMAX" BACK UP ON THE LIFT. IT'S OUR '03 SINGLE CAB SHORT BED CONVERTED HD SILVERADO. NOW THIS IS A HIGH PERFORMANCE THREE STAGE DIESEL BUILD. WE'RE GOING FROM BOLT ON, TO MILD, TO FULL RACE. NOW WE'RE JUST ABOUT READY TO SPRAY SOME PAINT ON THIS TRUCK, BUT THE BOOTH IS OCCUPIED AT THE MOMENT. SO I'M GONNA TAKE ADVANTAGE OF THAT DOWN TIME AND ADDRESS THE FRONT END. SEE THIS TRUCK HAS WELL OVER 200,000 MILES ON IT, AND THE INDEPENDENT FRONT SUSPENSION IS NOTORIOUS FOR WEARING OUT PARTS, LIKE BUSHINGS AND BALL JOINTS. SO I'M GONNA SHOW YOU WHAT IT TAKES TO COMPLETELY REBUILD THE SUSPENSION TOP TO BOTTOM. NOW THIS CAN SEEM LIKE A BIT OF A DAUNTING TASK, BUT I'M GONNA SHOW YOU SOME TIPS AND TRICKS ALONG THE WAY TO MAKE EVERYTHING GO THAT MUCH SIMPLER. (LT)>> THE NEXT THING WE NEED TO DEAL WITH IS THE TORSION BAR. IT'S ACTUALLY A SPRING THAT HOLDS UP THE ENTIRE WEIGHT OF THE FRONT END OF THE TRUCK. 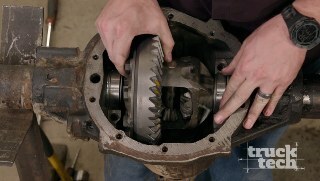 IT INDEXES INTO THE LOWER CONTROL ARM, AND THE OTHER END IS HELD STATIONARY ON A CROSSMEMBER BEHIND THE TRANSMISSION. NOW THIS IS ACTUALLY UNDER A FAIR AMOUNT OF TENSION. RIGHT NOW IT'S PULLING DOWN AGAINST THE SHOCK ABSORBER. SO WE NEED TO SAFELY RELIEVE ALL THAT PRESSURE BEFORE WE CONTINUE ON THE DISASSEMBLY OF THE FRONT SUSPENSION. I'M USING A HEAVY DUTY TWO JAW PULLER THAT ENGAGES A DIMPLE IN THE TORSION BAR KEY. WE'RE USING A PULLER TO RELIEVE THE TENSION ON THE END OF THE SPRING SO WE CAN SAFELY REMOVE THE KEEPER. NOW I'VE ACTUALLY SEEN GUYS USE A CCLAMP TO TRY TO DO THIS. IT'S PRETTY DANGEROUS BECAUSE THE TIP OF THE CLAMP COULD WOBBLE AROUND AND FALL OFF, AND IF YOUR FINGER'S IN THE WRONGS SPOT, WELL THEN YOU'LL ONLY BE COUNTING TO FOUR. I'LL COMPLETELY LOOSEN AND REMOVE THE ADJUSTOR BOLTS. THEN SLIDE OUT THE TORSION BAR NUT WITHOUT PUTTING ANY DIGITS THROUGH THE HOLE. THEN BACK OFF THE PULLER, RELEASING THE PRESSURE ON THE TORSION BAR. NOW THE BAR MAY NEED A LITTLE PERSUASION TO UNSEAT ITSELF, BUT AN AIR HAMMER DOES THE TRICK. I'LL LOOSEN THE WHEEL BEARING BOLTS A COUPLE OF TURNS, AND TAP THE HEAD OF THE BOLT WITH A HAMMER TO LOOSEN THE UNIT BEARING. THEN THE BACKING PLATE AND BEARING CAN BE LIFTED FROM THE SPINDLE. NEXT I'LL BEGIN REMOVING THE C/V AXLE FROM THE DIFFERENTIAL. DISCONNECTING THE SWAY BAR END LINK CLEARS THE WAY. THE UPPER BALL JOINT JUST SPINS WHEN I TRY TO LOOSEN THE NUT. SO I HAVE TO USE PLIERS TO FORCE IT INTO THE SPINDLE SO THE NUT CAN BE REMOVED. LOOSEN THE NUT FOR THE LOWER BALL JOINT, AND AFTER A FEW CAREFULLY PLACED WHACKS WITH A HAMMER THE SPINDLE CAN BE REMOVING. (NARRATOR)>> NEXT IT ALL GOES BACK TOGETHER. 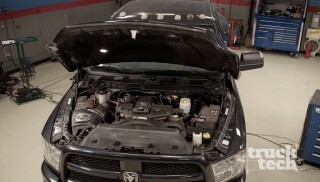 (LT)>> WE'RE BACK ON TRUCK TECH WALKING YOU THROUGH THE STEPS OF REPLACING IFS PARTS ON A LATE MODEL GM PICK UP. ONCE I GET THE TORSION BAR REMOVED FROM THE CONTROL ARM WE CAN BEGIN TO TACKLE THE BUSHINGS. I'LL SHOW YOU THE HARD WAY AND THE EASY WAY TO REMOVE BUSHINGS FROM A CONTROL ARM. THE HARD WAY IS BY HAND. CUTTING AWAY THE LIP OF THE BUSHING AND USING A THREADED BALL JOINT PRESS YOU CAN RENT FROM YOUR LOCAL PARTS STORE. IT'S A MESSY PROCESS AND IT WON'T COME OUT IN ONE SHOT. NOW I'LL SHOW YOU THE EASY WAY TO DO THAT. A HYDRAULIC SHOCK PRESS MAKES QUICK WORK OF THE OTHER BUSHING AND THE LOWER BALL JOINT. I'M USING SOME THICK WALL EXHAUST TUBE AND PARTS OF THE BALL JOINT TOOL AS PRESS FIXTURES. MUCH EASIER! WITH THE LOWER ARM FULLY STRIPPED, IT'S OVER TO THE BLAST CABINET FOR SOME CLEAN UP. WE HAVE THE ENTIRE FRONT SUSPENSION OF PROJECT "SUPERMAX" DISASSEMBLED AND CLEANED UP, AND NOW IT'S TIME TO START THINKING ABOUT HOW WE'RE GONNA PUT THIS THING BACK TOGETHER AGAIN CAUSE LET'S FACE IT, THAT WAS AN AWFUL LOT OF WORK AND WE DID HAVE TO HAVE SOME SPECIALIZED TOOLS TO REMOVE THE WEAR ITEMS FROM THE LOWER CONTROL ARM, SPECIFICALLY THE RUBBER BUSHINGS AND THE BALL JOINTS, BUT WHAT IF YOU DON'T HAVE ACCESS TO A HYDRAULIC SHOP PRESS, OR EVEN A SCREW TYPE BALL JOINT PRESS? WELL LUCKILY THERE ARE OPTIONS OUT THERE FOR EVERYBODY. WE WENT TO ROCK AUTO DOT COM AND PICKED UP ALL THE REPLACEMENT PARTS WE'LL NEED TO REASSEMBLE THE FRONT END OF THE TRUCK, AND WE PICKED UP PREMIUM MOOG PARTS WHEREVER WE COULD. SO WE KNOW THIS THING WILL LAST AS LONG AS POSSIBLE. OUR HAUL INCLUDED NEW BALL JOINTS, NEW CONTROL ARM BUSHINGS, NEW SWAY BAR END LINKS AND FRAME BUSHINGS AS WELL AS SOME SHOCKS, BUT WHAT IF YOU DON'T WANT TO MESS AROUND PRESSING PARTS IN AND OUT OF A CONTROL ARM? WELL ROCK AUTO OFFERS MOOG PROBLEM SOLVER CONTROL ARM ASSEMBLIES THAT COME PRELOADED WITH RUBBER BUSHINGS AND UPGRADED BALL JOINTS. SO ALL THE HARD WORK IS ALREADY DONE FOR YOU. THESE THINGS WILL BOLT RIGHT IN. NOW I'M GONNA GET STARTED BY GOING BACK TO THE PRESS. I'LL LUBRICATE THE NEW RUBBER BUSHINGS WITH PETROLEUM JELLY TO MAKE INSTALLATION EASIER. AN ARBOR PRESS IS ALL IT TAKES TO FORCE THE NEW RUBBER IN, BUT THE BIG BOY HYDRAULIC PRESS IS REQUIRED TO FORCE IN THE LOWER BALL JOINT. I'LL HANG THE SPINDLE AND NEWLY RESTORED CONTROL ARM, DEGREASE THE PARTS, AND DO SOME QUICK MASKING. THEN HIT THEM WITH SOME DUPLICOLOR SELF ETCHING PRIMER FOLLOWED BY SOME ROLL BAR AND CHASSIS SATIN BLACK. I TOOK SOME TIME TO SAND AND PAINT THE FRAME OF THE TRUCK TO MAKE THINGS LOOK A LITTLE BETTER BEFORE STARTING THE REASSEMBLY OF OUR NEWLY REBUILT FRONT END. NOW THAT ALL THE HARD WORK IS DONE IT'S A SIMPLE MATTER OF REINSTALLING THE PARTS IN THE REVERSE ORDER THEY CAME OUT. WITH THE LOWER CONTROL ARM IN, I'LL SLIDE THE TORSION BAR BACK INTO THE CONTROL ARM. THEN INSTALL THE NEW SHOCK ABSORBER. THE NEW MOOG UPPER CONTROL ARM SLIDES RIGHT INTO PLACE. WHEN INSTALLING ANY RUBBER SUSPENSION BUSHINGS NEVER FULLY TIGHTEN THE HARDWARE UNTIL THE TRUCK IS SITTING WITH ITS WEIGHT ON THE TIRES. THESE STOCK AXLES CAN GO BACK IN BECAUSE THE INCH AND THREEEIGHTHS SHAFT IS MORE THAN STRONG ENOUGH TO WITHSTAND THE ABUSE OF SLED PULLING OR DRAG RACING. I'LL INSTALL THE BACKING PLATE AND WHEEL BEARING, FOLLOWED UP WITH THE AXLE NUT, WHICH WILL BE TORQUED WHEN THE TRUCK IS SITTING ON THE GROUND. (LT)>> A VERY POPULAR MODIFICATION IS REGEARING THE AXLES IN YOUR TRUCK OR CAR. NOW WHETHER YOU HAVE A LIFTED OFF ROAD TRUCK ON BIG OLE MUD TIRES OR YOU'VE GOT A QUARTER MILE RACER, STEPPING UP TO A NUMERICALLY HIGHER SET OF GEARS GOES A LONG WAY TOWARDS IMPROVING THE ACCELERATION OF YOUR PROJECT. 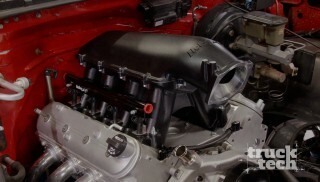 IN FACT WHEN IT COMES TO PERFORMANCE MODS IT HAS A VERY HIGH BANG FOR THE BUCK. NOW WHEN YOU'RE BUILDING DIFFERENTIALS THOUGH THERE ARE A LOT OF SPECIALIZED TOOLS INVOLVED. REALLY THE BARE MINIMUM WOULD CONSIST OF A DIAL INDICATOR, SOME CALIPERS, AND TWO DIFFERENT TORQUE WRENCHES. ONE THAT READS IN INCH POUNDS AND ONE THAT ALSO READS IN FOOT POUNDS. SOME AXLES EVEN REQUIRE A CASE SPREADER. SO YOU COULD IMAGINE IF YOU HAVE TO GO OUT AND BUY ALL THESE TOOLS AT ONCE YOU'D HAVE TO LAY OUT QUITE A BIT OF CASH. NOW ONE OF THE MORE IMPORTANT STEPS OF BUILDING A DIFFERENTIAL IS SETTING PINION BEARING PRELOAD. THAT'S BASICALLY JUST A MEASUREMENT OF HOW MUCH FORCE, OR DRAG, IT TAKES TO SPIN THE PINION IN THE HOUSING WITHOUT A RING GEAR AND WITHOUT A CARRIER ATTACHED. IF YOU HAVE TOO MUCH PINION BEARING PRELOAD THE BEARINGS WILL COOK, AND IF YOU HAVE TOO LITTLE THAT PINION CAN WOBBLE AROUND POTENTIALLY RUINING THAT BRAND NEW, VERY EXPENSIVE SET OF GEARS. TO PRECISELY SET THE AMOUNT OF PINION BEARING PRELOAD MANY AXLES USE A CRUSH COLLAR. IT'S BASICALLY JUST A SMALL PIECE OF METAL THAT SITS IN BETWEEN THE TWO PINION BEARINGS. AS YOU TIGHTEN THE PINION NUT THE COLLAR WILL CRUSH GETTING CLOSER TOGETHER. THE CLOSER THE BEARINGS ARE TOGETHER, THE MORE DRAG YOU'LL HAVE, BUT HERE'S THE PROBLEM. IT TAKES A TREMENDOUS AMOUNT OF FORCE TO TORQUE THE PINION NUT AND CRUSH THE COLLAR, AND YOU CAN'T JUST ZIP IT ON WITH AN IMPACT GUN EITHER BECAUSE A VERY SMALL TURN OF THE NUT COULD HAVE A VERY LARGE IMPACT ON THE PRELOAD. NOW IF YOU GO TOO FAR THE COLLAR IS RUINED. YOU HAVE TO TAKE EVERYTHING APART AND START ALL OVER FROM THE BEGINNING. SO THAT'S SOMETHING YOU WANT TO NAIL THE FIRST TIME AROUND. NOW YOU CAN ACTUALLY BUY A PINION HOLDING TOOL, AND HECK I'VE EVEN SEEN GUYS GO OUT AND USE A PIPE WRENCH OR A BIG PAIR OF WATER PUMP PLIERS, BUT THAT'S REALLY NOT THE RIGHT WAY TO DO THIS. SO I'M GONNA SHOW YOU HOW TO SAVE SOME MONEY AND BUILD YOUR OWN PINION HOLDING TOOL WITH STUFF YOU PROBABLY ALREADY HAVE LAYING AROUND THE SHOP. ALL YOU NEED IS A SCRAP OF PIPE, A LITTLE BIT OF PLATE STEEL, A DRILL, SOME BITS, AND OF COURSE A WELDER. WE'LL NEED TWO PIECES OF QUARTER INCH STEEL ROUGHLY THE SAME SIZE. FIRST MARK FOR A HOLE USING THE YOKE ALLOWING ENOUGH ROOM FOR A SOCKET IN THE MIDDLE. CLAMP TOGETHER IN A VICE AND DRILL BOTH PIECES AT THE SAME TIME SO THEY MATCH. THEN ROUND THE CORNER AND CLEAN UP THE EDGES. I'LL BOLT EACH PIECE TO THE YOKE. THEN SET IT IN POSITION TO TACK WELD THE TABS TO THE PIPE. THEN UNBOLT THE YOKE AND BURN IN THE TABS PERMANENTLY. WELL THERE YOU. IT ONLY TOOK US ABOUT 20 MINUTES AND IT DIDN'T COST A DIME. WE HAVE OUR VERY OWN PINION HOLDING TOOL THAT'LL LET US ACCURATELY TORQUE THAT PINION NUT AND SET THE BEARING PRELOAD. (JEREMY)>> IF YOU WORK ON BIGGER RIGS, DO ANY ROADSIDE SERVICE, OR JUST NEED SOME MORE POWER IN YOUR SHOP MATCO TOOLS HAS SOMETHING YOU SHOULD CHECK OUT. THIS IS THEIR THREE QUARTER INCH DRIVE 20 VOLT IMPACT KIT. 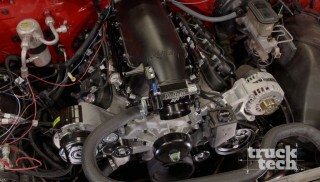 IT HAS A POWERFUL FOUR POLE MOTOR THAT PROVIDES 1,500 POUNDS OF BREAKAWAY TORQUE. IT HAS A VARIABLE SPEED TRIGGER, AND LED LIGHT. IT ALSO HAS A BALANCED HOUSING THAT MAKES IT EASY TO WORK WITH FOR LONG PERIODS OF TIME, AND THE KIT COMES WITH EVERYTHING YOU NEED. THIS HAS BEEN TESTED AND USED BY SOME OF OUR TOP FIRST RESPONDERS. CHECK OUT MATCO TOOLS DOT COM. (LT)>> WITH ALL THE POWER WE PLAN ON ADDING UNDER THE HOOD OF OUR LBSEVEN SILVERADO THE MOST IMPORTANT MODIFICATION WE CAN MAKE TO THE CHASSIS ARE THE BRAKES. THIS IS THE POWERSTOP Z-36 TRUCK AND TOW BRAKE KIT WITH CALIPERS, AND ALL IT TOOK WAS ONE CLICK TO GET EVERYTHING YOU SEE HERE FOR ALL FOUR CORNERS. FROM THE CARBON FIBER INFUSED CERAMIC BRAKE PADS, TO THE BEVEL DRILLED AND SLOTTED ROTORS, TO THE RED POWDER COATED CALIPERS. THE POWERSTOP ROTORS ARE BEVEL DRILLED AND SLOTTED, WHICH MEANS THEY'LL RUN UP TO 180 DEGREES COOLER. THE PADS ARE THERMAL SCORCHED FOR A FAST BREAK IN AND ARE CHAMFERED LIKE AN OE PAD FOR NOISE FREE BRAKING, AND THE BEST PART IS THE POWDER COATED CALIPER AND BRACKET WILL LOOK GOOD FOR A LIFETIME. WE'LL FINISH UP OUR BRAKE UPGRADES WITH SOME NEW FLEX LINES FROM ROCK AUTO DOT COM. ONE THING UNIQUE ABOUT ANY DURAMAX POWERED TRUCK IS ITS FUEL SYSTEM, AND AT THE HEART IS THE BOSCH CPTHREE HIGH PRESSURE INJECTION PUMP. IT'LL DELIVER UP TO 26,000 PSI OF FUEL TO THE RAIL, BUT IT'S ALSO RESPONSIBLE FOR SUCKING FUEL FROM THE TANK AND BRINGING IT UP TO THE ENGINE. NOW IF YOU'RE RUNNING A REALLY HOT TUNE THE CPTHREE CAN ACTUALLY LOSE RAIL PRESSURE, WHICH WILL RESULT IN A LOSS OF PERFORMANCE AND CAN EVEN THROW A CHECK ENGINE LIGHT. SO THE FIX IS TO INSTALL A LIFT PUMP. 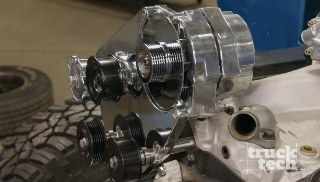 FAST STANDS FOR FUEL AIR SEPARATION SYSTEMS, AND THIS IS THEIR TITANIUM SERIES LIFT PUMP. THIS'LL FLOW 150 GALLONS PER HOUR OF FUEL, WHICH SUPPORTS 900 HORSEPOWER, BUT IT'S SO MUCH MORE THAN JUST A LIFT PUMP. THE TANK ON YOUR DIESEL TRUCK WILL CONTAIN SOME WATER, ALONG WITH FUEL, DIRT, AND SOME AIR. SO THE FAST SYSTEM STARTS OUT BY SEPARATING THE WATER FROM THE FUEL. IT THEN GOES ON TO FILTER DIRT AND CONTAMINANTS DOWN TO THREE MICRONS. THEN IT'LL SEPARATE ANY AIR FROM THE FUEL, WHICH WILL HELP EXTEND THE LIFE OF YOUR CPTHREE AND FUEL INJECTORS. THE KIT COMES WITH EVERYTHING YOU NEED TO COMPLETE THE INSTALLATION, LIKE BRACKETS, HARDWARE, AND FITTINGS, BUT WE ALSO OPTED FOR THE FUEL TANK SUMP AND BULKHEAD KIT ALONG WITH A FACTORY FUEL FILTER DELETE. I BENT UP A CUSTOM BRACKET THAT'LL MOUNT THE PUMP AS HIGH AS POSSIBLE TO KEEP THE FILTERS HIDDEN. YOU CAN CONNECT THE FAST PUMP TO A FACTORY FEED LINE, BUT TO PREVENT ANY POSSIBLE RESTRICTIONS WITH THE LARGER 150 SERIES PUMP WE UPGRADED TO A FIVEEIGHTHS INCH SUCTION TUBE AND SUMP. WITH ALL THE HOLES DRILLED, I'LL SLIDE THE PICK UP TUBE INSIDE THE TANK, ALONG WITH THE OTHER HALF OF THE RETAINER. THEN FROM UNDERNEATH THE TANK I'LL INSTALL THE SUMP BOWL AND TORQUE ALL THE SCREWS TO SPEC. BACK UP ON TOP I'LL DRILL A HOLE FOR THE BULKHEAD FITTING, CONNECT THE SUCTION TUBE INSIDE, FOLLOWED BY THE FEED AND RETURN LINES TO AND FROM THE FAST. (JEREMY)>> ALL RIGHT, I'VE GOT THE METAL REPAIR FINISHED UP IN THIS AREA AND I'VE TAKE A LITTLE TIME TO FILLER WORK IT. NOW WE'VE GOT A LITTLE BIT MORE RUST TO TAKE CARE OF BUT WE'RE GONNA SAVE THAT FOR ANOTHER TIME. (LT)>> I'M SUPER IMPRESSED WITH THE PROGRESS WE'RE MAKING ON PROJECT "SUPERMAX". 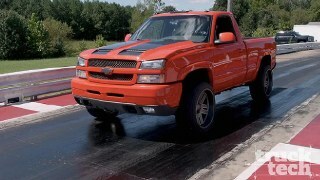 NEXT TIME YOU GUYS SEE THE TRUCK WE'LL BE WHEELING IT OVER TO THE PAINT BOOTH. (JEREMY)>> MAN, ALREADY TIME TO PAINT ANOTHER ONE? (LT)>> WE'VE GOT TO KEEP THESE THINGS COMING OUT. (JEREMY)>> YOU'RE PULLING THE TRIGGER. (LT)>> ALL RIGHT, SOUNDS GOOD!